Here's my bump as of 2 weeks ago... I'm getting a little nervous about how uncomfortable it might get towards the end, but I try really hard not to think about it. I see pregnant women all over the city, but the ones that look like they are ready to pop, also look a tad miserable. For now, I'm still taking subways and running all over town. I'm getting much more tired than I used to, but I'm not letting it stop me just yet because, if I do I will basically be screwed. It's very important to be able to be mobile here. If i dont chase after a cab or run down the steps so I dont miss my train, i could be more than a half hour late to EVERYTHING...and i'm rarely if ever on time to begin with!! 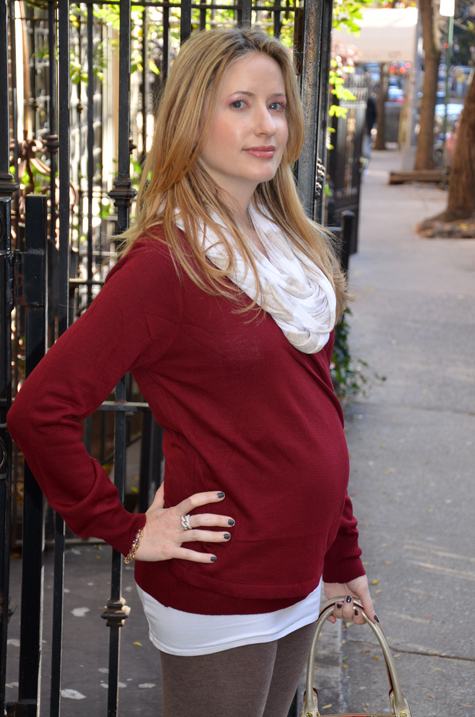 Pretty typical for this time in my life....nothing new to report, but I have to say I LOVE Asos for maternity clothes (the red sweater)...so comfy! Isn't ASOS wonderful! I admire many of their items online, but have also ordered a dress that I just love and was so impressed with their shipping and everything! You are looking lovely and I'm glad the baby-to-be is still allowing you to do all your running around! You look lovely. Yes definitrly load up on comfies. I have been so behind on reading blogs these days, I didn't realize you were pregnant! Congratulations! I'm pregnant too! I'm due March 23rd. When are you do? You look so cute in your outfits posts with your baby bump! Love it! Asos has the best stuff! I didnt know they made maternity clothes..not that I need them but its good to know. MIA! Look how big your belly is getting! Aww, you're beautiful as always. :) I looove ASOS too. Such great pieces. That sweater is adorable! And you're looking great- totally glowing! I hate to say it, but I was so uncomfortable...a big giant mess! You are looking great! !